Our fizzy base stars acidic citric acid of cream of tartar reacting with baking soda. That’s held together with some fragrant cocoa butter and some polysorbate 80 so the cocoa butter emulsifies with your bath water, and then some sparse spritzes of witch hazel and 70% isopropyl alcohol. The addition of wee bits of water helps the crystallized citric acid and Epsom salts dissolve a wee bit so we can smoosh ’em together and leave them to re-crystallize, binding the bath bombs together. While the Cream of Tartar is optional in the strictest sense of the word, I really don’t recommend leaving it out—making these bath bombs without it is like bath-bombing on hard mode. 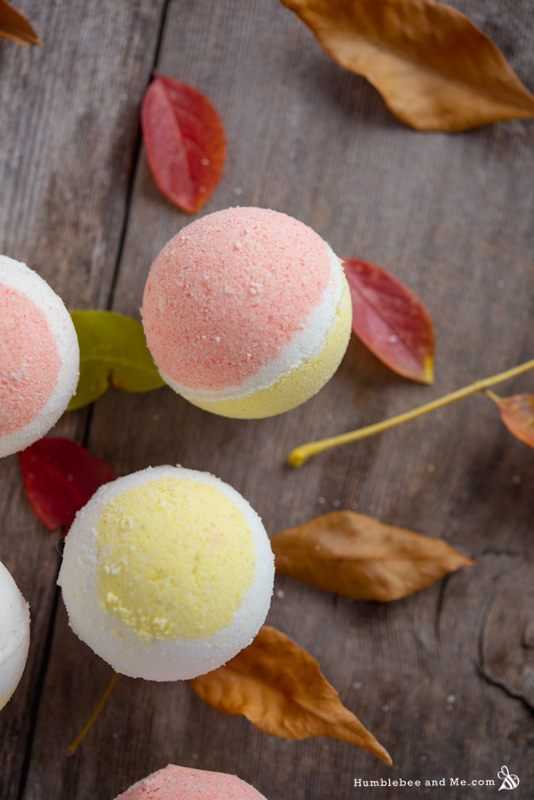 It’s a simple addition that will make your life much easier, and it makes the end bath bombs much nicer as well. 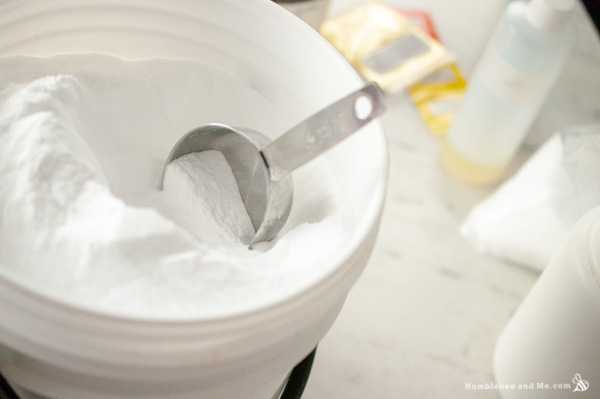 If you’re finding the Cream of Tartar at your local grocery store is crazy expensive, make sure you check your DIY supplier—it’s usually much more affordable from DIY stores! I used some yellow and orange micas to get the yellow and orange bits, and decided to leave the centre white for no real reason other than I like how white centred bath bombs look. You can definitely switch things around if you want the order of the colours to be more authentic! I’ve kept the scent soft and Halloween-appropriate—straight vanilla, with some faint cocoa-y wafts from the inclusion of cocoa butter in the bath bomb base. 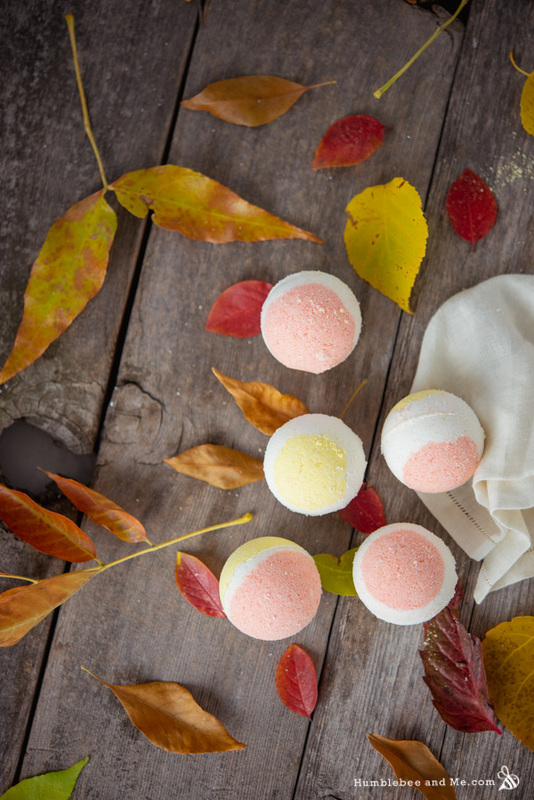 You could easily customize the bath bombs by using something different, like perhaps a fall-ish fragrance oil, or even cocoa absolute. It’s up to you! Add the melted oils to the powdered ingredients, stir for a wee while, and then add the benzoin. 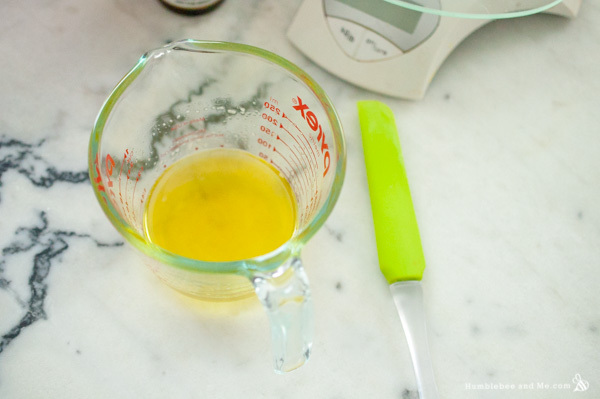 Blend everything together using a flexible silicone spatula, and then switch to using your hands when the melted oils are no longer hot and you won’t be soaking your hands in benzoin. When you’re done blending the final mixture should be uniform and resemble cookie dough a bit. 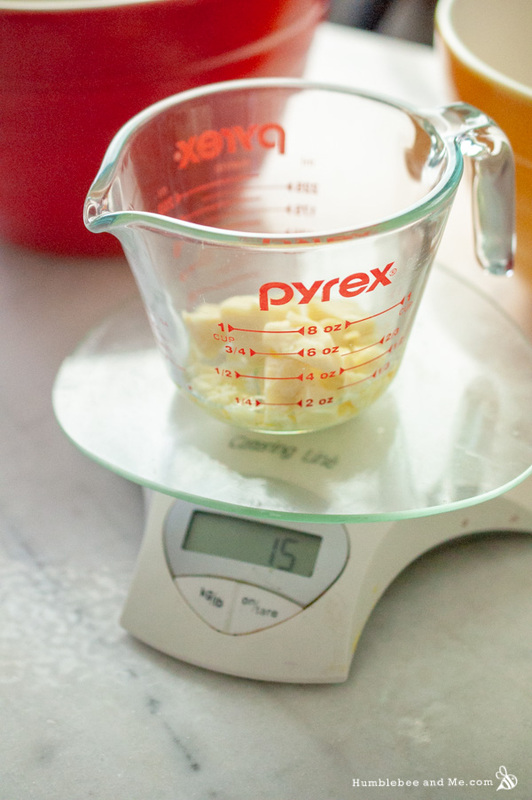 If you grab a handful of the mixture and squeeze it should hold together a little. 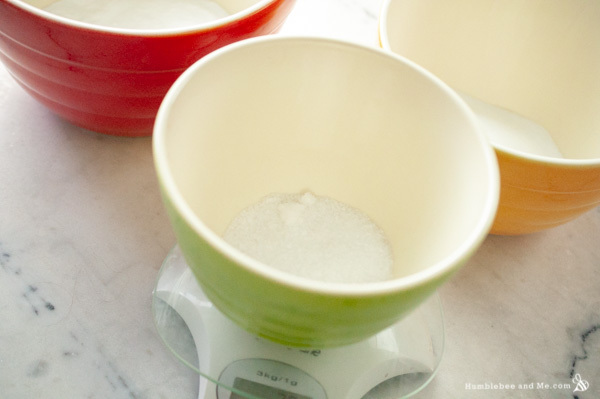 Quickly divide the mixture between three bowls; you want one bowl that’s mostly white, and then two smaller bowls to colour—one yellow and one orange. I’d say you want about 70% white, 15% yellow, 15% orange. Use the micas to colour the two smaller bowls. Once the mixture will hold together, it’s time to mold it! You’ll want a bit of yellow in one half of the mold, a bit of orange in the other half, and then heap on the white to create the middle. 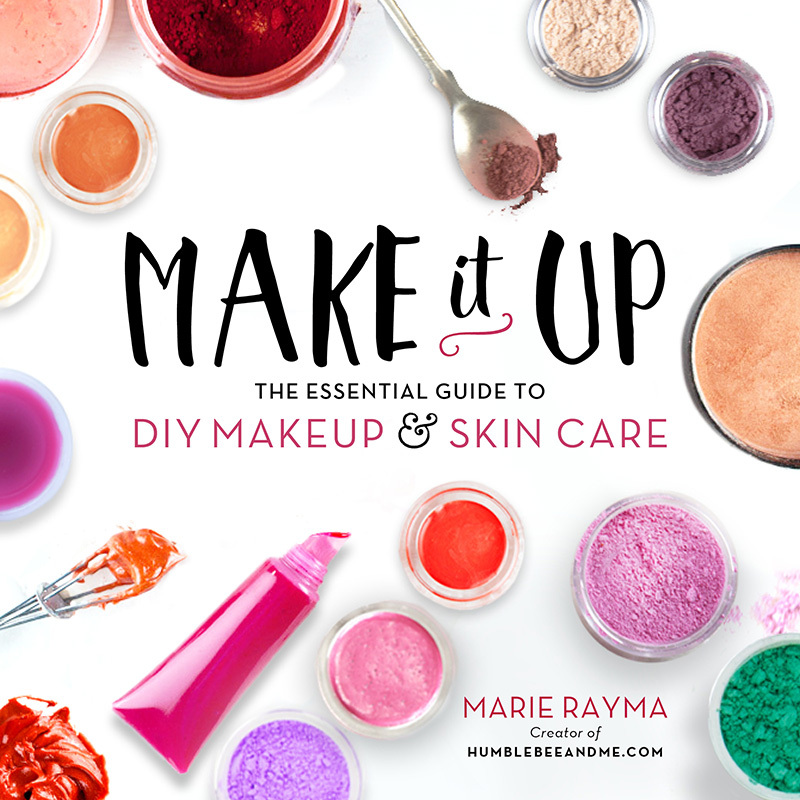 If the bath bombs start to become finicky as you work, that’s likely because the mix is starting to dry out—mist in some more liquid until they become workable again. When you’ve used up all the powder, leave the finished bath bombs to dry overnight. To use, drop in a hot bath and enjoy! 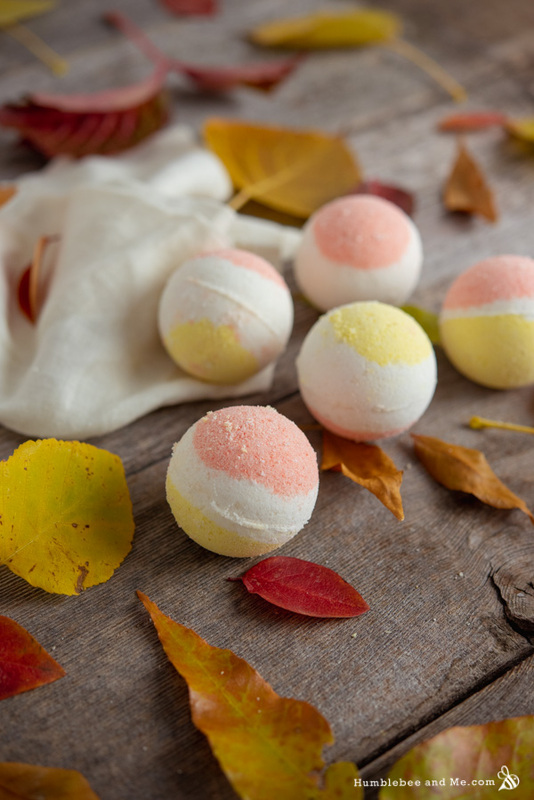 This recipe will make ten to fourteen 2″ bath bombs, depending on how many survive molding. You can use more citric acid instead of Cream or Tartar, but I would strongly advise you not to. The micas are optional, though you will obviously lose the candy corn theme if you eliminate them! You can use a different essential or fragrance oil if you prefer. What is benzoin resinoid used for? Can you use something else? Thank you. It smells like vanilla; see the substitutions list for fragrance alternatives. I made these. And I followed the formula- excluding the fragrant part, and colours- to the letter. I think this is the first time in ages I’ve done that! Always tinkered here and there. But bath bombs… they be the bane of my existence. The wretched luck I’ve had with them. This formula? It was perfection! And got the lovely foam I like in my bombs. I am so glad to hear this! I never get a chance to formulate in humidity because Calgary is decidedly not humid. Ever. 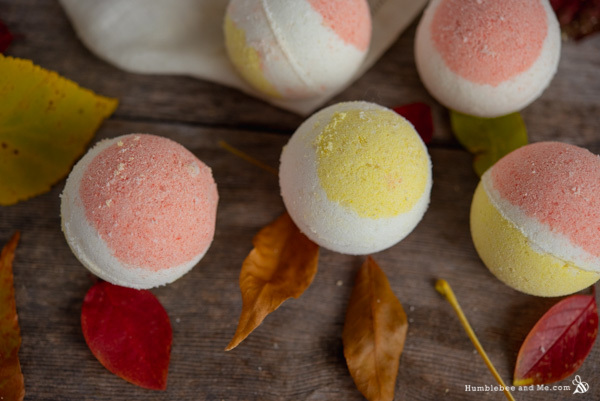 I know humidity-compatible bath bombs can be a challenge, and I’m so glad to hear these are standing up to Irish dampness! And also massiveness—holy whoa, lady, that’s not a bath bomb, it’s a bath torpedo! When I am finally and firmly settled here right and proper, there will be a room for you! And my workshop would love to have an experienced visitor! Slowly restocking my beaker collection! Oooooh, an enticing offer to be sure! But also… aren’t you due for a trip back to Canada at some point?! Crazy thing… I just got your reply to my comment! Almost a month and a half later! Nah, not heading back to North America for a good couple of years. I’ve not explored Europe yet and it’s now on my bucket list! But, if you’re back in the UK, and all is settled with me, I shall visit you there! Only if we take a trip to France for tea.